Horton was founded September 20, 1886. The town was christened and named after Chief Justice Judge, A.H. Horton, eminent jurist, held in high esteem by the people of Kansas; for nearly twenty years he served as Chief Justice of the Kansas Supreme Court. The construction of the Rock Island Railroad throughout the state of Kansas in 1886, fathered the city. It was a Boom Town and grew so rapidly that it was called the "Magic City." Later, the name "Little Chicago" was used by supporters who hoped that because of its phenomenal growth, it might equal or surpass Chicago, Illinois in size. The name "Little Chicago" was also used derisively in regard to Horton by envious neighboring cities. On March 21, 1887, the Chicago, Rock Island and Pacific machine shops at Horton were staked out. Within 16 months the new town had a population of 4,000. Starting from an open field to being a bustling city in that length of time was indeed magic! In December 1936, a representative of the Rural Electrification Administration, from Washington, D.C. held a meeting in the High School Auditorium in Horton, to explain how an electric cooperative could be formed. Those present, immediately formed a board and conducted a survey of potential users. The results were so positive that early in 1937 plans were submitted for the first REA project. The first pole was set November 10, 1937 and on April 1, 1938 the first line was energized. A Memorial was erected at the corner of 5th Avenue East and 15th Street in 1987 by the Kansas Electric Cooperatives and the Kansas State Historical Society. This was also the location of the first pole set. 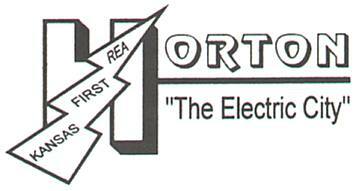 Because Horton was the first city to acquire a REA project, the Horton City Commission voted to adopt "The Electric City" as the city logo on May 1, 1995. The Horton Swimming Pool features public swimming with a playground, tennis, basketball, and volleyball courts, and track, soccer and baseball fields are nearby.